Have you ever cooked something you thought would be quite nice that turned out to be unimaginably, shockingly, fantastically delicious? Well this is one of those things! 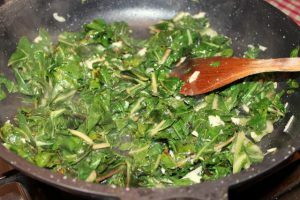 Not to mention that it is meat-free with the main element being Swiss Chard, a vegetable I normally think of for a side dish or bulking ingredient for soups or stews. Don’t get me wrong, that makes it sound as if I have little affection for Swiss Chard which just isn’t true. I think it is an unsung hero of the vegetable world! We grow it very successfully in our garden. Usually we grow two and they both turn out to be giants. The beauty being that you can just take a few leaves as you need them and just keep on returning for more. And they last for ages too, there is next to nothing going on in our vegetable patch at this time of year but the Chard still stands strong! For me, Swiss Chard is a bit like two vegetables in one. The stem is hard and ridged – think ‘celery’ and you would be close. The leaves are more like robust spinach which doesn’t release water when cooked. Often people discard the stem and just cook the leafy part but as long as you cook them for different lengths of time, both are tasty. You can see my older recipes for Stir Fried Chard & Beans and Tomato, Courgette & Swiss Chard Stoup here. I found this recipe on a fellow bloggers site – Stacey Snacks – and I bookmarked it for later use. I finally got round to making it last week and it literally knocked my socks off! Not only was it amazingly delicious, it was accompanied by a certain smugness that comes from making a meal out of next to nothing that tastes so damn good! I literally cannot emphasize enough how great it was and I insist that you all go out and get some chard and cook it at once! This dish could be made vegetarian by using olive oil but I made mine using quite a lot of duck fat. Here in SW France, the locals cook almost everything in duck fat so I figured that I would do the same. It has a wonderful meaty flavour which works particularly well for this dish, especially when making the fried bread croutons! In fact it added such a gutsy depth to this that my husband asked me if I had added Marmite, such was the explosion of meatyness! I would strongly recommend that you use duck fat also unless you are vegetarian of course. This is a totally rustic dish. When I made it, I thought that it might need something to go with it, perhaps a pork chop or a slice of gammon. But when I tasted it I realised that it doesn’t need a thing, it is more than filling enough on it’s own. And that is part of it’s utter charm, it’s simplicity. A humble dish of bread, Swiss Chard and cheese, a truely satisfying poor mans plate proving that you can feed a family with next to nothing. What a fantastic recipe for today’s financially testing times – just one more reason why this dish is such a winner. 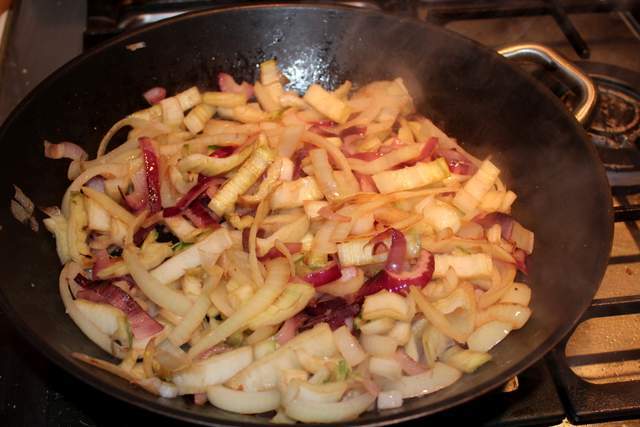 Heat 1 tbsp of the duck fat in a frying pan and fry your onions gently for 5 minutes. Then add your chopped chard stems, season well and continue to cook for another 10 minutes. 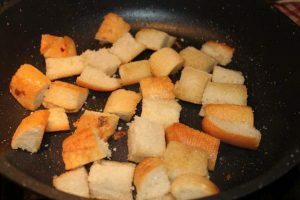 Meanwhile in another pan, heat another tbsp of duck fat and fry your bread croutons until golden and crispy. Remove and set aside. Wash your chard leaves and roll them up like a cigar and slice to achieve ribbons. In the bread pan heat the last tbsp of duck fat and fry the chard leaves with the sliced garlic until wilted. It only takes a few minutes. Season well. Stir in the splash of red wine vinegar. Assemble your panade. First drizzle the bottom of your oven proof dish with a little olive oil and then add the bread croutons in a layer. Mix together the onions and chard leaves and layer on top of the croutons. Pour the chicken stock over the dish. 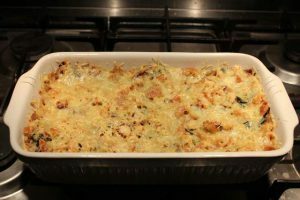 Top with a layer of fresh breadcrumbs and finally a thick layer of gruyere cheese. Bake in the oven for 1 hour until the cheese is melted and bubbly. Serve and enjoy. I have entered this dish into the blog challenge ‘Bookmarked Recipes’ hosted by Jacqueline over on Tinned Tomatoes. 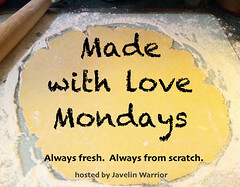 I have also entered this into Credit Crunch Munch which is hosted by Camilla from Fab Food 4 All and Helen from Fuss Free Flavours. 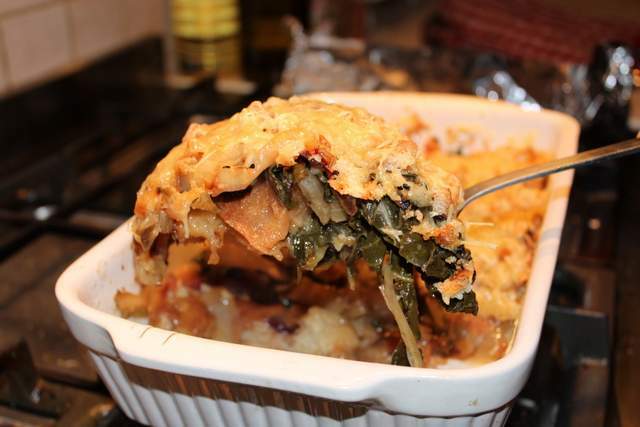 19 Comments on "Unbelievably Good Swiss Chard Panade"
Yet another recipe to bookmark! I’m a huge swiss chard fan too, and am amazed how it keeps on growing all year round…and so incredibly easy to grow. Like you I rarely celebrate it in it’s own right and usually use it to bulk out soups, stews, stir fries and curries and occasionally as a veggie side dish sauted in olive oil and lemon juice. 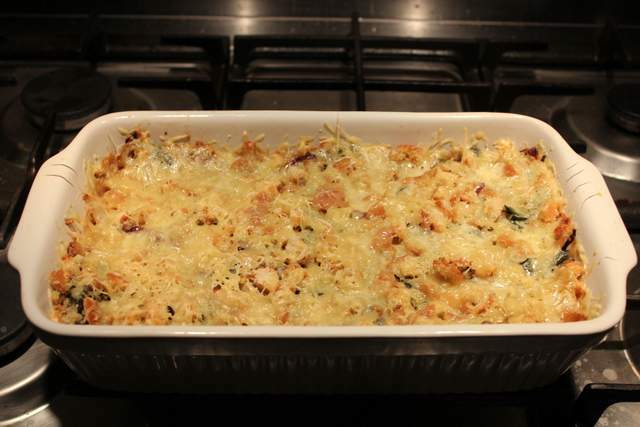 But this recipe looks fabulous, gruyere now on my shopping list! I will be making. Made and very much enjoyed for our dinner last night! It really is a truly wonderful celebration of the wonder veg that is Swiss Chard, my favourite recipe for it yet. And I SHALL be making again, though luckily I made enough for tonight’s dinner too. Was wonderful on it’s own like you say, though I roasted Mr F a confit duck leg too which was the perfect companion. Thanks you! I also meant to say the dish works particularly well with the duck fat, which gives it the sumptuous depth of flavour that you simply wouldn’t get with olive oil. Sounds fabulous. I’m going to rank up the luxury by putting a layer of grated gruyere in the bake as well as on top. Well isn’t this just perfect – we’ve had a great big bundle of chard in our fridge and I’ve been postponing cooking it, hoping to find a fresh new way to use it. Here we go then! Anneli, this looks amazing and I LOVE that it’s meatless with swiss chard taking the place. Anytime I can find an amazing veggie dish where you don’t miss the meat, I’m happy Thanks so much for sharing! Thanks! Glad you like it. This certainly makes meat free eating a joy! Hi Hannah, thanks so much for dropping by. 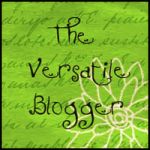 Gave me a chance to find your lovely blog too. Glad you liked this dish…it’s a total winner! Thanks Elizabeth. It is indeed a really great dish, I can’t recommend it enough. Thanks so much for stopping by and leaving me a comment.